Science fiction is one of my favorite genres of film, and when you add the themes of war and militarization along with the enemies being giant bugs from another planet, I’m completely on board. 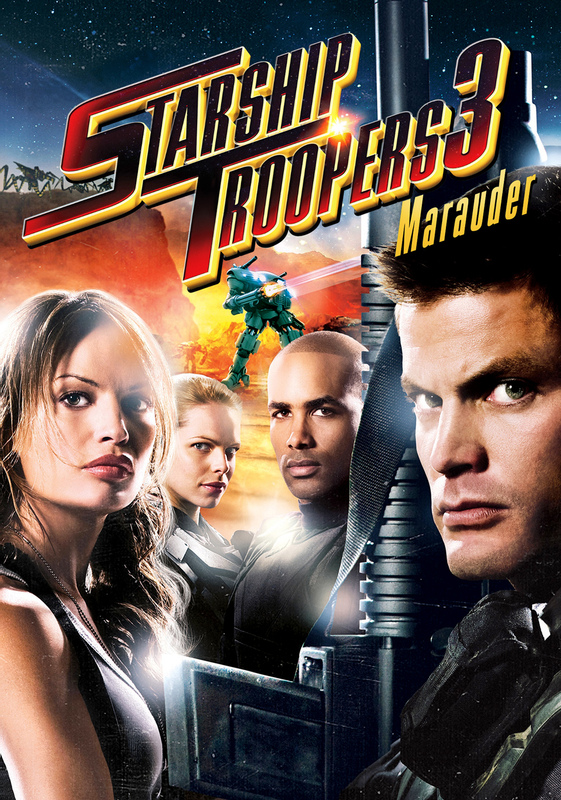 This makes the Starship Troopers movies right up my alley, but not all of them have gotten much praise. Based off of a 1959 novel by Robert Heinlein, the story of humanity in a utopian, yet oddly fascist, world in the 23rd century who go to war against a race known as the Bugs provided a lot of heavy handed messages that the author believed in. It seems pretty ripe for feature film story telling, and in some ways it worked. This series, like many others, certainly has its fair share of ups and downs. 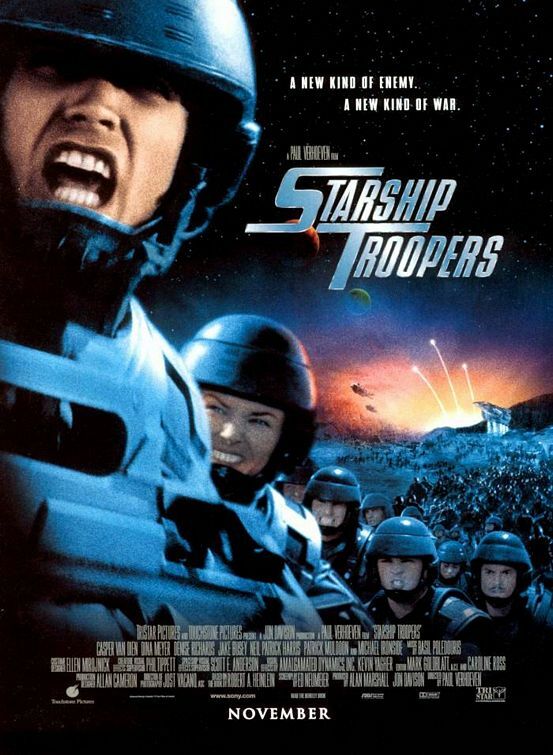 Let’s start with Paul Verhoeven’s original cult classic from 1997, Starship Troopers. By the 23rd century, the Earth is now classified as a federation that is ruled in a fascistic and militaristic way. It’s a strange utopia that condones violence to survive and the only way to become a citizen is to serve in some branch of the military. That’s exactly what Johnny Rico (Casper Van Dien) intends to do once he graduates high school. Along with his friends Carl (Neil Patrick Harris), Carmen (Denise Richards) and Dizzy (Dina Meyer), Rico joins the military and is assigned with Dizzy to Mobile Infantry. After a race of giant insects called the Bugs shoot an asteroid across the galaxy and completely wipe out Buenos Aires, the Mobile Infantry and the Federation’s air fleet mobilize to the Bug planet of Klendathu, where a bloody war begins for the survival of the human race. When it was first released, Starship Troopers was not met with too much success critically and the box office return was less than what was expected. Over the years, however it’s gained a status as a cult classic. When the film first begins and a lot of time is spent at the high school and basic training, I was worried that this would be an uneven mess with a disappointingly low amount of action. The first 45 minutes seemed to drag, but when the action does begin, I became thankful for all the time setting up the characters’ personalities and relationships. This makes the war scenes all the more impactful, and when someone gets hurt or is killed, I really felt like something was lost. Believe it or not, this is not a mindless movie and does evoke some real emotion, even though the acting is less than stellar. Let’s face it, though, this is a sci-fi war film, so let’s get into the real nitty gritty. Paul Verhoeven may have had some missteps as a film maker, but it’s much easier to remember his films like Starship Troopers, Total Recall, and RoboCop. This movie stands as one of his achievements. The special effects are out of this world for the time and were even nominated for an Academy Award. When the Bugs swarm the soldiers, the movie gets so intense and action packed, which is where it really shines. There’s also lots of what I like to call “Verhoeven gore,” which, if your like me, adds some fun to the movie. He just seems to love blowing people up. Finally, this film works great as a satire of fascism and blind love and devotion to the military. The 1959 novel this film is based on got a lot of flack for seemingly glorifying a Nazi-like utopia. Verhoeven used this, flipped it on its head, and created bitingly funny satire that’s the backbone of this entire movie. While I was planning on not really liking this movie when it first started up, I ended up loving it as the credits began rolling. It’s such a fun movie loaded with action, great special effects, and hilarious satire that starts in the very first scene. I was even surprised with how much I cared for the characters, despite some rather tone deaf performances. This is a movie I wish did better when it was first released so Verhoeven would have returned for a sequel. Nevertheless, it is what it is and this particular movie is a total sci-fi blast. I feel like I was just talking about direct to video movies with my review of the Darkman films, and here I go again. The original Starship Troopers was the only film to make it to theaters, and all the sequels went right for the home viewers. 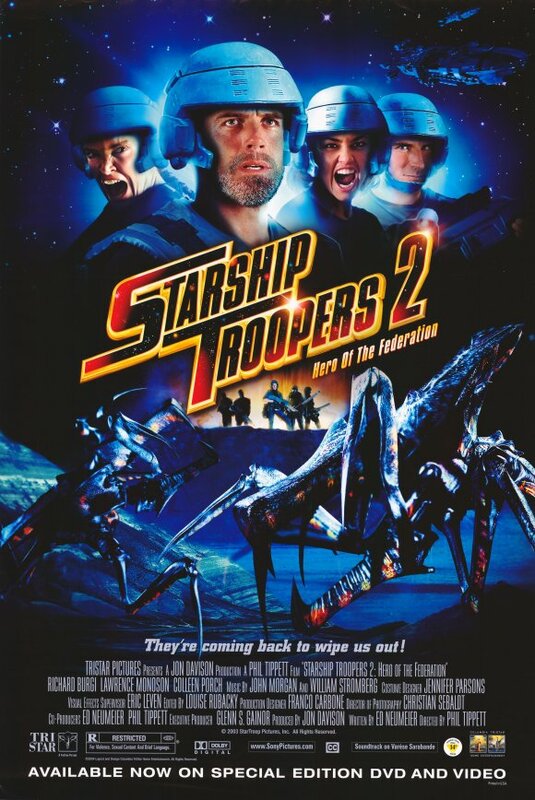 Starship Troopers 2: Hero of the Federation premiered on Encore (now known as Starz Encore) in 2004, and then went on DVD a few months later. The reasons can not be more clear. The war against the Bugs has been raging for nearly 5 years, and while the humans are victorious in many places, there are fronts where the Bugs have the clear upper hand. On one such planets, a group of troopers are overrun by a swarm of Bugs and are forced to retreat to an abandoned outpost called Hotel 1-8-5. With their commanding officer, General Shepard (Ed Lauter), missing, the squad is under the new leadership of psychic Lt. Dill (Lawrence Monoson) and Sgt. Rake (Brenda Strong). As the Bugs find the outpost and prepare to attack, Pvt. Sahara (Colleen Porch) releases an imprisoned officer, Captain Dax (Richard Burgi), in the outpost to help fight against the swarm. What these troopers don’t know is that the Bugs can now infect people and infiltrate squads from within, which spells danger for these soldiers confined to this small area. With Hero of the Federation, we go from the knock out action, special effects, and satire from the first one and just downgrade it to what comes close to the lowest it can possibly get. I understand that a t.v. movie isn’t going to have the budget of a Hollywood feature film, but my goodness this movie looks hideous. Aside from the fact that it was shot on HD video, it’s just a dark and colorless film. All of the exterior shots are filmed at night with only a small area lit or sand completely covering up any scenery that could’ve given me an idea of where everything was taking place. Once the soldiers get into Hotel 1-8-5, things remain dark and colorless, but everything now just looks old and gross. I give the film makers credit for the claustrophobic feeling, which is nailed really well, but this is just not an easy movie to look at. Phil Tippett, who is known for his special effects work on Jurassic Park and the first Starship Troopers, returns to direct this film which helps in a lot of ways. For one thing, for a t.v. movie that’s then released right to DVD, the special effects are really good. They aren’t stunning, but there are some scenes that had really impressive practical work. I can’t really say the same about his work with the actors. The acting in the first film really wasn’t anything special, but this is a different story completely. There are some line deliveries that made me either cringe or burst out laughing. The fact that this isn’t a big budget film really isn’t much of an excuse since I’ve seen t.v. movies with impressive performances. I feel like the ambition of this project just didn’t meet the standards of what was actually possible in making a good movie. 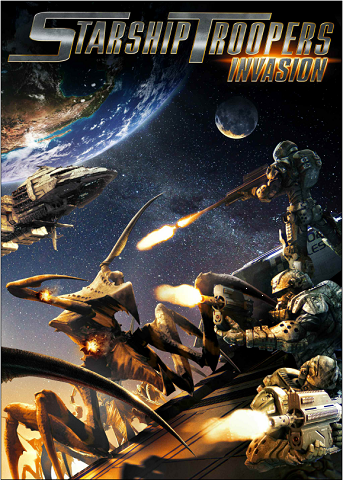 Starship Troopers 2: Hero of the Federation is more than a disappointing sequel. It hardly even registers as a sequel. Not only was it released almost 8 years after the original, but it was also a t.v. movie that loses a lot in translation to the small screen. The acting is subpar, the cinematography is bland, and the only saving grace is some cool special effects and an action filled ending. If you want to watch a movie with close to the exact same storyline, watch The Thing, or forget this storyline and just put on the original Starship Troopers. So far we have a one great movie and one that really bugged the hell out of me, pun definitely intended. We still have a few more movies to go with this series, but that review will be coming soon. For now, stick with the original.